Ian lives in a suburb where everything's the same. The houses are the same; the cars are the same; the families are the same; and their aspirations are the same. But Ian is different. Openly gay in his bigoted high school, Ian doesn't exactly fit in. But he's not worried he's been training in dance for a long time and soon he'll be able to leave town and train to become a professional. Then he falls in love with Jess, the high school quarterback. 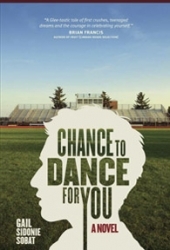 "Chance to Dance for You came out of my experiences as a high school teacher in an affluent suburb. I have watched unhappily as young people who were in any way different were mistreated, sometimes with tragic results. My wish is that this book, in some small way, may offer hope to that young man or woman who is misunderstood, ostracized or bullied. For those struggling with issues of sexuality, I'd like to add my voice to the chorus: "It gets better!"'"